Pacon Neon Bond Paper - Assorted Colors - Letter 8.50" x 11"
Hot fluorescent colors that bring your message to life. An all-purpose bond colored on one side and comes in a film wrapped package. Excellent for printing, photocopies and is laser compatible. Recyclable. 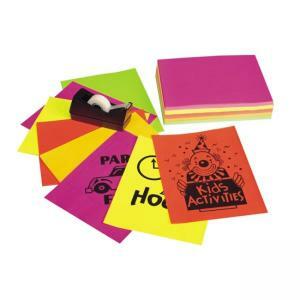 $25Pacon Array Brights Bond Paper - Assorted Color - Letter 8.50" x 11"
$12Geographics Sicily Letterhead Bond Paper - Gray 100 / Pack - Letter 8.50" x 11"
$25Pacon Array Bond Paper Assortment - Letter 8.50" x 11"
$21Pacon Array Pastels Bond Paper - Assorted Colors - Letter 8.50" x 11"
$10Pacon Neon Bond Paper - Red - Letter 8.50" x 11"
$10Pacon Array Parchment Bond Paper - Assorted Colors - Letter 8.50" x 11"
$78Xerox Recycled Bond Paper - 5000 / Carton - White - Letter 8.50" x 11"
$24Southworth Credentials Bond Paper 500 / Box - White - 8.50" x 11"
$11Pacon Neon Bond Paper 1 Pack - Assorted Colors - Letter 8.50" x 11"